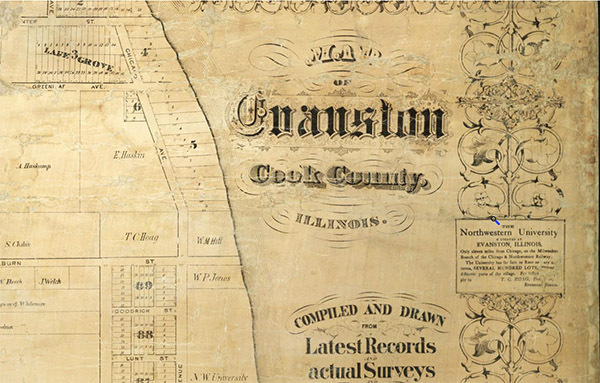 Evanston History Center Historic Newspaper Collection, 1872-1922 The Evanston History Center Historic Newspaper Collection consists of digitized and edited images from the microfilm collection of Evanston newspapers at EHC. The images span the dates 1872-1922 and are from three separate newspapers published during those years: the Evanston Index (June 6, 1872 to December 19, 1914), the Evanston Daily News (April 1, 1912 to December 31, 1914), and the Evanston News-Index (January 1, 1915 to December 30, 1922). Though the EHC newspaper collection includes later images (both in hard copy and microfilm) only issues from before 1923 were digitized to avoid any copyright restrictions. This digitization project was completed during the summers of 2015-2017 by graduate students of Northwestern University (NU) and was sponsored by the Chabraja Center for Historical Studies at NU. Project collaborators were: the Evanston History Center, the Northwestern Library, and the History Department at Northwestern. Substantial technical assistance was provided by the NU library and its staff, with special thanks to Peter Burtch and Josh Honn. NU graduate students who managed the project’s work were Sam Kling (who initiated the project), Bonnie Ernst, and Beth Healey. Users should be aware that a test showed that the search capability of the images is only 40-45% due to the condition of the original newspapers (when microfilmed) and the condition of the microfilm images. For more information, please contact the EHC Archivist at glehner@evanstonhistorycenter.org. Society of American Archivist Guide to Using Archives: Click on the image below for a general guide published by the Society of American Archivists that provides helpful tips for researchers using an archives.